1) Is there any difference between Mobile Testing and Mobile Application Testing? 2) What are the important functionalities in Mobile Applications? 3) What is the difference between TDMA and FDMA? TDMA is Time Division Multiple Access. In TDMA technology each user in the channel owns the channel bandwidth for some time in a round robin fashion, all GSM handsets use this technology. 4) What are value added Services in Mobile Application Testing? 5) How to test the MMS application? 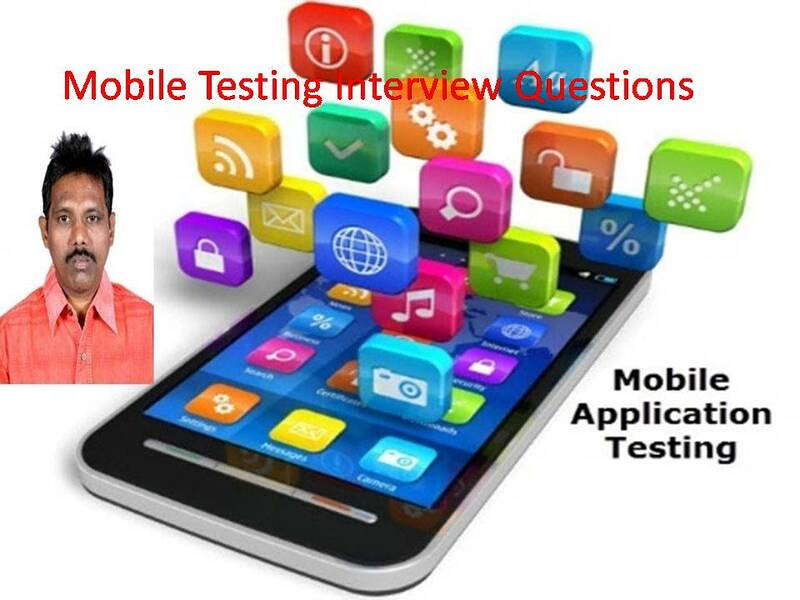 6) What could be the Possible Test Cases to test the Functionality and Performance of a Mobile Client Application? – All mobile features: Incoming call, outgoing call, Incoming SMS, outgoing SMS, phone directory, call history, redial facility, all called numbers, all received numbers, storage capacity of calls, SMSs, audio, video storage, display. – Multimedia services: Radio, audio, video capabilities, MMS etc. – Internet: Connectivity, browser display, downloads, uploads etc. – Utility: Games, reminders, calendars, clock etc. – Performance: Fill all the hard-disk with say video files. Check how much time it takes to open the files and is there any impact on the way the video is played. Is it slow etc. 7) How we test battery back up time using load testing especially for mobile testing ? 3. Charge the battery up to 20% of it’s capacity use it until the battery is fully drained out. 4. Charge the battery up to 40% of it’s capacity use it until the battery is fully drained out. 8) What is the advantage of symbian OS devices comparing with j2me and Brew OS devices? – Symbian is the latest OS where as j2me and Brew OSs are old ones. – Symbian OS has SIS file format where as j2me has JAR file format which means this is a third party software and anybody can develop softwares in this OS. – Symbian is a fast browsing and a fast operating system. j2me is not as fast. – Symbian OS provide touchscreen phones such as UIQ phones. No such facility on j2me. – Symbian OS offers rich UI. 9) What are the modes of downloading content on mobile from server? 11) Is there any automation tool for mobile application testing? Fitness tool can also be used to automate mobile applications.